Habit: Shrub, < 2 m. Stem: bark gray; branches many, spreading, stiff, rooting; twigs +- thorn-tipped, red or red-purple. Leaf: evergreen; petiole 1--4 mm; blade 10--15 mm, elliptic to obovate, thick, glabrous, abaxially flat, base acute to rounded, tip rounded, margin sharp-toothed or entire, veins not prominent. Inflorescence: 1--6-flowered, glabrous; pedicel 1--6 mm. Flower: generally unisexual; hypanthium +- 2 mm wide; sepals 4; petals 0. Fruit: 2-stoned, 6 mm, red. Unabridged Note: Rhamnus crocea and its closely related species were considered conspecific by C.B. Wolf (1938) (e.g., Rhamnus crocea subsp. crocea, Rhamnus crocea subsp. ilicifolia, Rhamnus crocea subsp. pilosa, Rhamnus crocea subsp. pirifolia). 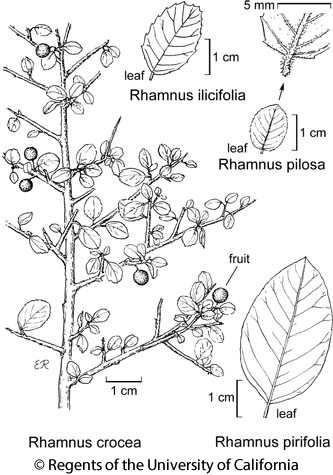 Another, Rhamnus insula Kellogg (Rhamnus insula subsp. insula (Kellogg) C.B. Wolf) is restricted to Mexico (Baja California). The species are distinctive but intermediates exist. C.B. Wolf (1938) identified Rhamnus crocea/ilicifolia intermediates from Marin Co. to the California/Mexicoico boundary; Rhamnus ilicifolia/insula, Rhamnus crocea/pilosa, and Rhamnus ilicifolia/pilosa intermediates occur in southern California, especially in San Diego Co. Clearly, the Rhamnus crocea complex in California needs studies using modern techniques. Citation for this treatment: John O. Sawyer, Jr. 2012, Rhamnus crocea, in Jepson Flora Project (eds.) Jepson eFlora, http://ucjeps.berkeley.edu/eflora/eflora_display.php?tid=41069, accessed on April 19, 2019. KR, NCoRO, SNH, CW, SW; Markers link to CCH specimen records. Yellow markers indicate records that may provide evidence for eFlora range revision or may have georeferencing or identification issues. Purple markers indicate specimens collected from a garden, greenhouse, or other non-wild location.